With the momentum created by all the negative media around AI, I believe we need more clarity on what are the benefits for humans with mundane jobs, the very type we say is coming close to being automated. 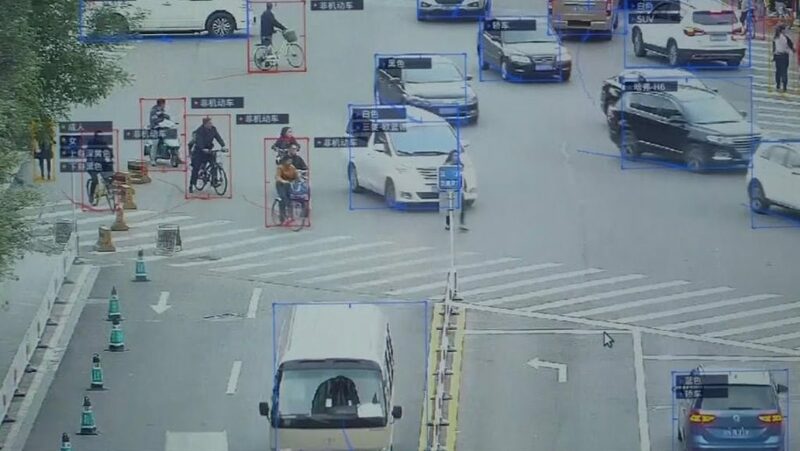 There are many steps between today’s world and one where that super intelligence reigns, and much to learn about what the next set of human skills will look like. I believe it’s a better use of our time talking about how we can leverage AI to empower people today. 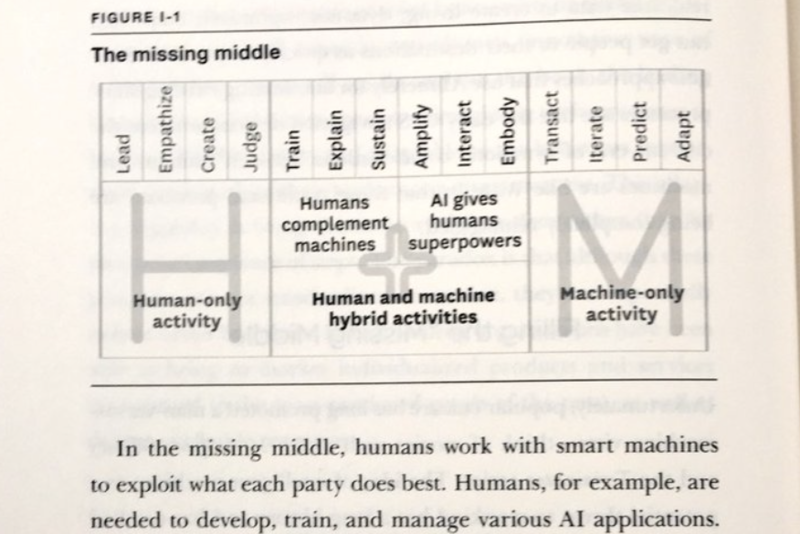 I must say one of the passages in the Human+Machine book from Paul Daugherty (Accenture’s Chief Technology & Innovation Officer) triggered me to write this article, since it’s a recurring framing I use when talking about AI to large organisations. This specific passage talks about the spectrum between fully Human tasks vs fully automated ones, crossing the (missing) connector or Humans powering AI and AI powering super humans. While Humans lead and empathise, they can train AI to help them be at it’s best every chance and amplifying their reach and capabilities, with AI making sure you improve one tiny bit, every single time. Thinking about an example from the Finance Services sector, more specifically a European Bank, that had a big business problem: they didn’t trust their corporate commercial banking sales force. Their ambition was to monitor and control every move their workers did in their day to day to be able to manage them better. The team took them on a slightly unexpected journey, by getting them to empathise and understand what a day in the life of both the sales agent and the supervisor looked like. We decomposed their day, and arrived to something like the below (these are sales agents that visit their corporate clients’ offices and service customers remotely). 8am – drive out to first client office and go! You can see why they had high staff turnaround right?! So if the employee was experienced and new how to deal with all of the manual work, paperwork, reporting and expectation management they’d be fine, but unfortunately you can’t train someone to be this efficient with these daily hours of work, and expect them to pick up by osmosis. This means all new joiners struggled to perform, which means they had only a fraction of the sales agents performing well, and assumed the best (NOT! ): The rest of them are lazy! We needed to work hard to help them understand the difficulty of being able to focus on what you really should – the customers – when most of your day is spent driving, writing and noting down manual work orders, to then input them and complete your 15 hour day! Once we distilled this and started finding the hacks these agents were using we begun to really bring to life how poorly they were enabled to be that high performing sales force, with consistent results across the board – retention, cross-sell, satisfaction. The employees were using WhatsApp, SMS, calls, google docs, etc. – essentially, anything that facilitated the exchange of information, and reduced the amount of admin work they had to deal with and help them get home sooner! Data lost, security risks and impossible to measure what you need to improve and optimise. The most experienced ones knew what were the signs they needed to pay attention to when maintaining conversations to spot opportunities, and obviously focused less on the process and more on the relationship and getting as much information as they could to be able to pitch and sell the right products. The less experienced agents struggled while trying to follow the exact processes while having to engage with customers. The leadership team was bought into the approach after a half day of design thinking, and recognised on the end of day 2 that they were wrong – we were both surprised and delighted that they bought in to the enablement story, rather than control as the catalyst for the right behaviours from their sales force. We thought of how we could bring some fresh thinking to help these sales agents do a few key things better, and make each agent as efficient as the bank’s best agents! This is really important, but for me the key bit is how we can dig deeper into the insights generated by this new set of experiences, and how these enable a second tier set of AI applications. Here’s a few of the things we managed to build on top to maximise the value generated out of every sales contact. This second set of features was the basis of understanding how to maximise the probability of success of an entire sales force. Learning from how the best perform and apply those learnings in the experience of the not so good, and continuously tweaking this to sustain the performance. Is a 25% increase in territory sales enough? An employee satisfaction and retention index with a meteoric increase? Operating cost reduction? The trial cohort was based in a European capital but imagine scaling this out to over 8.000 salesmen country wide. We’re talking about hundreds of millions potential impact in sales alone. This is unfortunately not what we typically see, with many organisations jumping straight into building large data science teams that will never have the data, the processes and the experiences that will enable them to succeed at being a value builder for the organisation, rather than just another flavour of research; or the multi million spend in systems and infrastructure without an adequate operating models that sets the AI teams up for success. Another key point that jumped out of the work with this client is the fact we had Business, IT, Operations and Marketing in the same room working as a team, enabling each other to avoid the corporate political conflicts as well as the pitfalls of digital transformation. 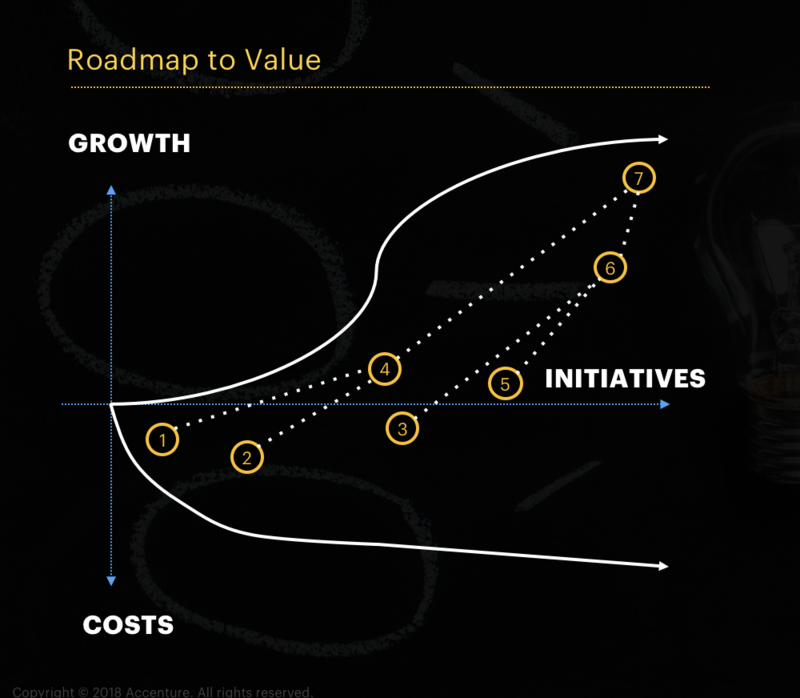 These might not be technologically shiny use cases, but as my Chief Strategy Officer Omar Abbosh preaches, the key to drive a sustainable transformation is to unlock that trapped value today, that will release the investment that will fund the turnaround of large incumbent corporations. The Hundreds of Millions of Dollars question: would this have been possible if we’d gone searching for AI use cases? We need to speak less about AI use cases and more about business challenges that can be solved with the help of AI. This is the bit missing to do the same for other business functions, (supposedly) threatened by AI: Customer service agents that can personally address the problem for every individual customer and solve it at the first attempt, doctors that never misdiagnose and prescribe the best course of action for every individual patient, businesses that provide you with what you need, when you need it, through the channel you prefer. Get your outcomes aligned, your context understood, your actions digitised, the impact measurable, and then you can continuously deliver the benefits of AI – at scale, and consistently, continuously improving your business’ performance and your organisation’s relevance – both for customers and employees. 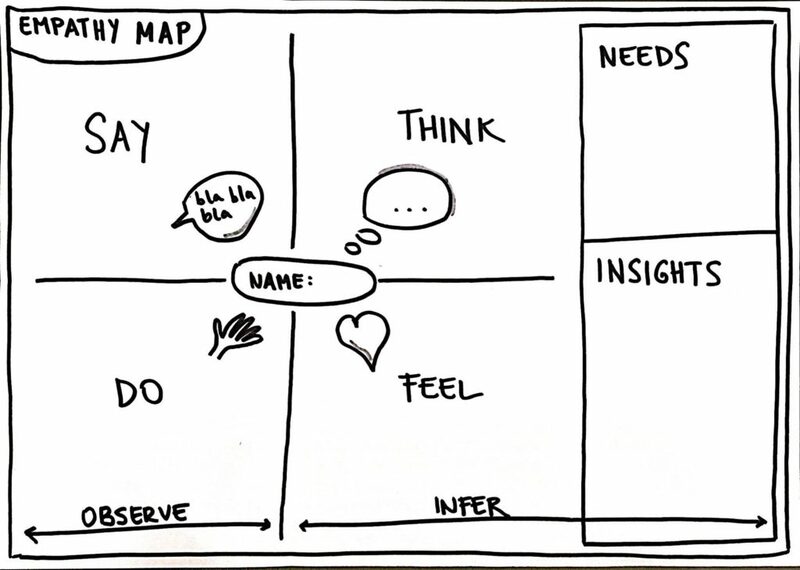 Build your teams of superheroes, and they will take your business to the next level, first by improving their performance, then by improving what they do for your customers, and ultimately by reinventing the role they play in the organisations they work for, and you play to your customers.